In online business, it is important to think quality while you are looking for affordable domain name registration and hosting services. In a situation where there are so many domain name registrars every domain name service provider wants to distinguish itself from the competition. For the customers, they need an unbiased review of available services to know who to patronize. In this review, we will discuss Namecheap.com, one of the leading voices in domain and web hosting services in the US. Richard Kirkendall started Namecheap.com in Los Angeles, United States in the year 2000 to provide affordable domain name services. The hosting service followed in 2007 set up by its vice president Matthew Russell. Together, Namecheap.com manages about 3 million domains from over 800,000 customers according to the company. What the customers want is a reliable and affordable service. The Online business investment starts from these two services and can sometimes make so much difference in online experience. The typical online entrepreneur wants to deal with a service provider who has the price advantage over the competition and does not provide poor service. What are the features offered by namecheap.com? Going by industry standard, namecheap.com parades industry best of features listed as follows. • Bulk actions give you the pleasure of doing more by selecting a domain and select the menu. • Push domains allow for easier action like granting right to use an email around a domain selected. 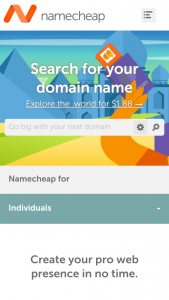 • Third-party domains can be managed from the domain list in your namecheap.com account. • Get your hosting package usage statistics in your hosting package management page. Namecheap.com also comes with other standard features you will get from other quality domain services around. How customer friendly is namecheap.com? Every company will beat their drum of great customer support when you ask if they are friendly. However, the best way to know is to go through existing customer reviews to know how satisfactory the customer support tradition has been. Our assessment of friendly support is not when a customer asks for help only; we also are interested in knowing how easy is it for customer to use the services on self-help basis. What we found out is a 6 out of 10 situation. While most customers who left a review on different platforms are happy about the domain service, they weren’t so happy regarding the hosting service. What is namecheap.com knowledge and speed of service like? Most customers who left reviews regarding namecheap.com knowledgebase gave excellent rating for the wealth of information available to resolve any encountered issue. However, in term of speed from its technical support to resolve issue, the expectation seems higher than the result. Overall, we award 6 out of 10 rating for knowledge and speed of service. How easy is namecheap.com to navigate? Building a website takes you in a romance ride with your hosting company. You need to go back and forth making the necessary settings to get your site to optimal functionality. When the provider’s site is difficult to navigate it impose additional stress on the site builder especially the DIY folks like me. Our assessment of namecheap.com shows their account page is hassle free to navigate compared to their competitors. You don’t get annoying adverts trying to up sell you on something. You also have a clutter free page to work with and get your head focused on the tasks at hand. We give it 7 out of 10. What is namecheap.com pricing & ease of payment like? Going by its promotional offer, you can buy a great domain for just $0.48 per annum or pay $5.58 for five years discount offer. For hosting plan, the price is $9.88 per annum discount offer and you get free website domain and free WhoisGuard as a first timer. Although you have to prepare to pay more when renewing your domain or hosting plan, the first time buyer enjoys better privilege from discount offer. Namecheap.com also offers easy means of payment giving up to five different options to pay, very convenient. Namecheap.com provides WhoisGuard for one year free of charge and you can renew it for $2.88 in subsequent year if you wish. There is also a year discount on its Comodo PositiveSSL certificate to further guarantee your security while it sends you regular important security updates to keep you abreast with security details from time to time. How happy are the existing customers of namecheap.com? When you want to know how effective a service is, the best place to look are the existing customers. Our finding on namecheap.com from existing customers shows above average recommendation of the service. Many of its existing customers are happy with the service they get and would continue to use the service. Our rating with regards to happy customers is 8 out of 10. • Affordable entry costs for domain and hosting services. True to its name, the entry discount is quite attractive. Although it may not be the cheapest, the renewal prices going forward are even more attractive at $10.29 per annum. • Clean navigation. You don’t get to see those annoying upsell ads flying to your face while you try to find your way around to get work done. Having a cluttered free space to work is an added advantage you will get, working on namecheap.com pages. • Guaranteed security. As the internet continues to advance, the need for security becomes more demanding. Namecheap.com is up to date on its security services making it essential that every domain and hosted service is secured with the latest security infrastructure. • It’s not the cheapest. For one off deal, namecheap.com is not the cheapest. But if you intend to renew your initial subscription, it is the best offer you can get as the renewal compensates for any cheaper initial offer you will get from competition. • No phone support. If you are not contented with live chat on namecheap.com services, you may find its phone service disappointing as it does not exist. But this should not be a problem because other customer service provision will adequately compensate for the lack of phone support. Namecheap.com offers top level domain and hosting services. Whether you are new or a veteran online entrepreneur, you will find the namecheap.com services very pleasing. If you need to move from your existing web service to namecheap.com, it will help you move your stuff completely for free.